– an accident in which someone got hurt badly. have been among our most viewed blog posts. April 28, 2014. For the past 7 months I have experienced incarceration at a “Max B” facility. TRYING my best to stay under the radar. I am keeping busy in as many activities as I can, as per the suggestions of my good friends Jeff & Lynn Grant. Jeff has traveled this journey before and he & Lynn dedicate their lives to help others cope. Using their inspiration, I have been fortunate to be accepted in the Inmate Program Assistant (IPA) Course. It’s a 2 week course that trains you as a Facilitator and Teacher’s Assistant. Part of the training is to be able to sense the emotions and mindset of the inmate. A responsibility I have accepted is to help a fellow inmate if they seem helpless and depressed. My biggest challenge is adapting the skill of seeing the warning signs. Other activities I’ve joined are the Alcoholics Anonymous program and Catholic services. Both are a blessing to keep me sane. God is the light, I thank him each day for opening my mind and spirit to see the right path. I have acknowledged my faults and have accepted the word of God, now I don’t have to struggle alone. This ha given me the strength to let go of my control and place it in the hands of my Higher Power. A couple of things happened recently, unexpected events, giving me pause for thought. These are sad acts that seem to happen more and more as I expand my circle of acquaintances. Here are two stories I will share with you. Stories of suffering, where a person can appear positive and upbeat on their exterior. But suffer miserably internally. I am a member of the AA Fellowship, have been since October of last year. In January a Gentleman named Julio joined us. He was the quiet sort only giving his name and declaring he was an alcoholic, like us. In the beginning he was not comfortable sharing of himself. In jail it is very common to be tight lipped about one’s self. Some predators will use it against you. Julio is 25 years old, living in Washington Heights, north of Manhattan. He was no stranger to the streets. As the weeks went on Julio slowly let down his guard. He would share in the rooms as well as reach out to us in the yard. He started telling us about his experiences through “war stories.” He described himself a “socialite,” living the night life in Manhattan is where he “belonged.” Networking with people from the music and fashion industry. He was planning to work a promotion agency when he was released. He wasn’t really romancing the party atmosphere as much as he felt connected to that style of living. He was a tall young man with a square jaw and soft welcoming eyes. It was easy to like him as a person. He had his game plan and was looking forward to implement it. His outside appearance seemed solid. Mt. Weaver is a young man on Cellblock C-2, he also was welcomed to our little band of brothers at the Catholic services. He was in his late 20’s with a full scruffy beard, ginger colored. He was a soft spoken man witha perpetual grin. He was a very good listener but didn’t have much to say. Mr. Weaver was a young father of two little ones, a boy and a girl. Every Bible study he would flash photos of his family, such a proud Papa. At mass back in late March, he stood up and asked the community to pray for his momma. She is battling cancer, she was taking chemotherapy that was draining her energy. He was fearing the worst. About two weeks ago his mother came for a visit. I was told by people in his block he was noticeably nervous and distracted. As he was being escorted to the visiting area, you must follow the instructions of the escorting C.O. This particular gentleman had a chip on his shoulder and was giving him a hard time because he wasn’t paying attention to the simple commands. Weaver told him about the visit and his concern for his mother. The C.O. had a despicable reaction, making horrific, cold and ungodly comments about his ailing parent. Weaver handled it like a champ and vented to us about the situation instead of reacting to the officer. About three days later he was complaining of chest pains but was afraid to ask for the nurse. That night he collapsed and was rushed to the hospital. Again, I feel I should have sensed the seriousness and made him call primary call asap. I grieve for both men, feeling frustrated and helpless. When inmates are rushed to the hospital for such serious reasons, they rarely return to the same facility. I may never know their outcome, whether good or bad. 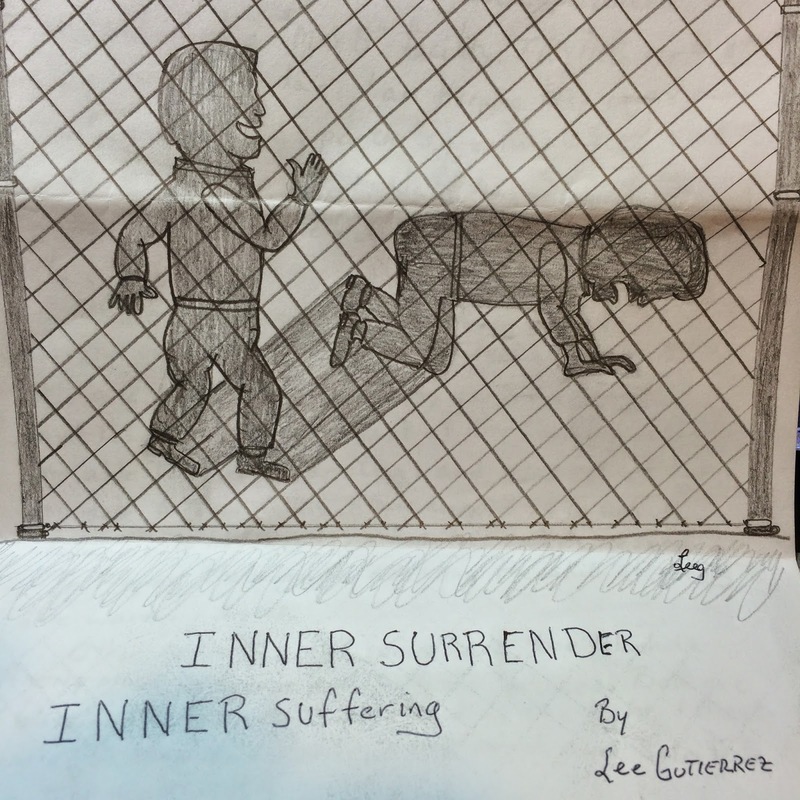 The internal suffering when incarcerated is real. It breaks the spirit and takes lives. I acknowledge that I lack the experience, the intuition of seeing the signs of suffering. That simple fact doesn’t take away the pain or make me feel any better. Please say a prayer for Julio & Weaver. May they find serenity soon.